Lexington has one Japanese fast food outlet plus six sit down Japanese restaurants, all excellent, unlike any other dining experience, and well worth a visit. A unique feature of Japanese establishments is their tradition of preparing your food right in front of you. The full scale restasurants offer octopus, seaweed salad, eel, fluke, rice paper, green mussels, dragon rolls, fish eggs, sea urchin, and of course Sushi. 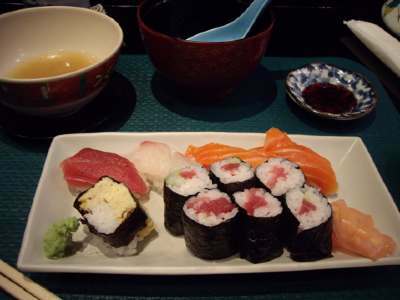 Their various rolls (each restaurant has its own specialties) are interesting, with their fish and vegetable ingredients. You can order your favorite steak, fish or chicken at a Japanese eatery, but they'll fix it with a different twist than you're used to. Rice, noodles and soups are traditional Japanese side dishes but, as you might expect with a heavily populated mountainous island, sea food makes up a large portion of the menu. For example, that rice might be made into a seafood rice cake. A typical soup might contain various seafood items. The Japanese use both chopsticks and silverware, so you can experiment with the sticks but if you get frustrated there are always the utensils. Japanese wines and teas are very delicate in taste. The Japanese have borrowed certain dishes from the Chinese, Koreans and Vietnamese, but they fix them slightly differently, with their own seasonings. 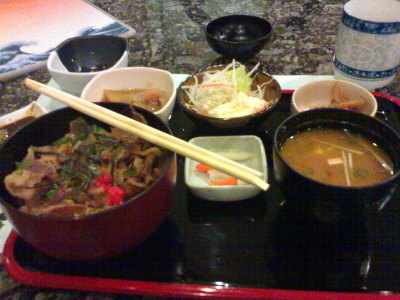 Japanese food tends to be milder than mainland Asian cooking. When you eat at a full scale Japanese restaurant you always have the choice of a Hibachi Chef (in Japan, "teppanyaki") fixing your meal at your table on a propane heated iron griddle or simply having the kitchen fix it and serve in the the regular way. 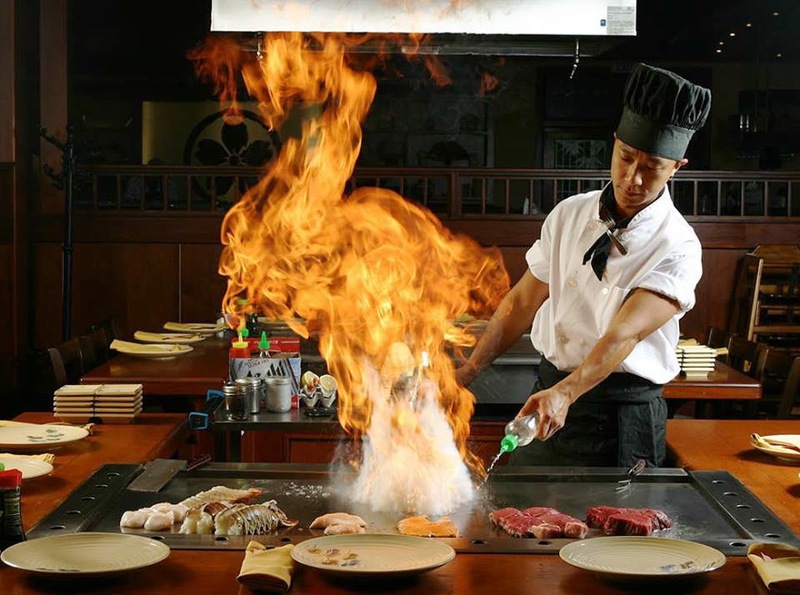 The Hibachi Chef is a little more time consuming, because they put on quite a show. But your first couple of times, and if you have children or guests with you, it's worth it. After you become a veteran Japanese restaurant patron, you can lapse back into the more traditional format. Hananoki bills itself as a Steak House and Sushi Bar but as a regular restaurant it does quite well. There are three classic steak dinners, three seafood dinners, one chicken and one vegetarian dish, and three steak - fish mixtures. Then there are 17 rolls, a Japanese item which is a good lunch or , if you combine it with an appetizer and soup, a light dinner. For examples, the Wildcat is a hefty mix of shrimp, crab, masago, avocado, cucumber and seaweed for $9; and the Sunrise is tuna, salmon, yellow tail, masago, avocado, cucumber, soy bean, and lobster salad for $10. Lunch weekdays 11:30 - 2 pm. Dinner 4:30 - 9:30. The address is misleading. Hananoki really faces down on Richmond Road from a high bluff, next to Mia Mexico. To get to it, turn North onto Man o War, then look for the first right turn. That takes you up behind the restaurant. 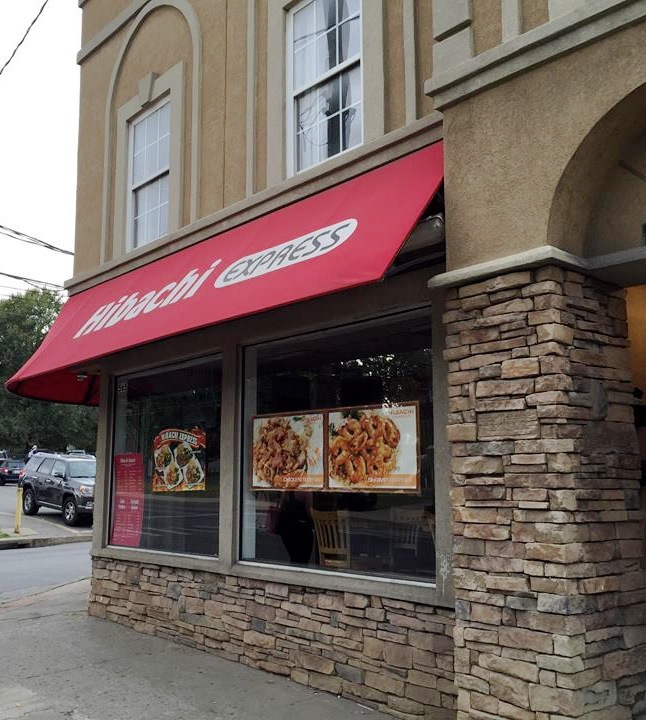 Hibachi Express is a Japanese Stir Fry restaurant on South Limestone across from Memorial Hall. You could sit inside and eat, but there are only a few tables and it works best as a carryout. The menu's limited but the food's tasty. You pick an Appetizer from the Spring Rolls, Crab Rangoon, Sesame Balls and Dumplings. You choose your Entree from Vegetables, Steak, Chicken, Shrimp, Fish or some combination of these. Then you pick Hibachi or Teriyaki Sauce. It all comes with Yum Yum Sauce. You're going to spend about $10 : $6-7 for the entree and $3-4 for the appetizer. The place gets hectic at lunchtime and is especially popular among Business, Law and Engineering students. Kobe Stone Grille is the only Japanese restaurant in town offering hot rocks. You order your favorite raw meat, whether seafood, steak or chicken. It comes chopped in small chunks, delivered with a foot square superheated rock slab in a wooden carrying rack. You skewer the meat with a tiny fork and place it on the rock, allowing the meat to cook to your liking. This may sound intense, but it makes for a very entertaining meal, rather like fondue without the pot. Kobe's also offers all the other Japanese staples : sushi bar, traditional menu items, beers and wines. It's the smallest Japanese restaurant in town but definitely worth the stop. Kobe's has the greatest selection of specialty rolls in town. Beaumont Center, 219-2166. From downtown, take South Broadway )Harrodsburg Road) south just past Man o War and turn right into Beaumont Center. Get in the right lane immediately and take the first right turn. Turn left at the T, and as you round the turn look for Kobe on your left. Miyako is out Richmond Road on the left just past New Circle Road. Miyako has the most extensive teriyaki menu in town with seven dinners, and offers two tempuras (battered and fried dishes) as appetizers and four more as dinner sides. Its raw sushi menu features squid, sea urchin and octopus. Cooked sushi includes Tako, Smoked Salmon, Ebi, Tamago and Unagi Kani. Miyako's Sushi specialty is its Dancing Tuna Roll, spicy tuna wrapped in seaweed and tart rice, topped with seared tuna, wasabi sauce, scallions and masago. Heavy with wood, the decor conceals the fact six lane Richmond Road is only feet from the building. The Plum Wine is the best beverage on the menu. Tachibana is the Japanese restaurant closest to the Toyota plant, and the one most often visited by the executives there, along with their guests from the home office back in Japan. LexMark and other major corporations are also nearby, and drop by frequently for lunch or early dinner. As such, it is a bit pricier than the others, a bit more formal, a bit more traditional, and a bit more authentic. The biggest difference seems to be in the quality of the beef and the number of beef entrees on the menu. They emphasize Sushi a little less and the wine list is more extensive. Flavoring has not been Americanized as much, and the Seaweed Salads seem to have a deeper, darker, richer taste. 785 Newtown Court. 859-254-1911. Downtown, head out West Main and turn right on Newtown Pike. Follow it out past Lexmark over New Circle Road. Turn right turn into Newtown Court and look for Tachibana on the left. Tomo. Located where East High Street turns into Tates Creek as it rounds the bend in Chevy Chase. Deceptive front entrance looks like small storefront restaurant but opens out into a futuristic wood and mirror interior, remodelled in 2007, very upscale and classy. This is not one of those Japanese restaurants where the cook sets up in front of you at a Hibachi table and prepares your meal right there. They bring it to you from the kitchen or sushi bar. But they have excellent sushi and rolls. 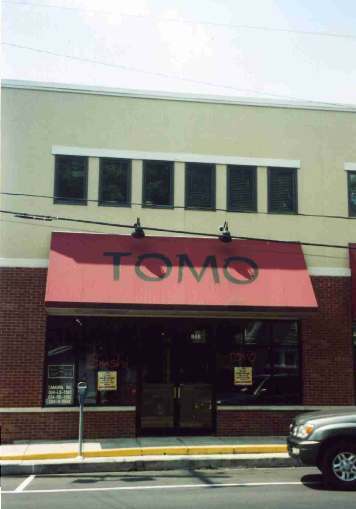 Each day Tomo offers 17 specials and six standards. Among the rotating specials, when the Grilled Squid, Braised Pike or Simmered Hot Radish Fish Cake are available, try them. From the six Sushi appetizers, we like the Mackerel, Flounder and Sea Cucumber. The regular appetizers have some unique items : Shrimp Dumplings, Asparagus Beef Maki, and Green Mussels. There are seven soups, of which our favorites are the Miso and Red Miso. From eight salads, we like the Octopus Vegetable, Tomo Special (Greens, Crab, Avocado, Masago, Cucumber and Shrimp), and Sunomono Moriawase (Seafood, Cucumber, Seaweed). Tomo offers 12 dinners. We like the Chicken Teriyaki, Salmon Teriyaki, Saba Mackerel, and Asparagus Beef Maki. If you're in the mood for steak, Tomo lists three. The Yakiniki is a rib eye with onion and yakiniki sauce. We've been there on various occasions with different friends who have tried this and they've all raved about it. But there's a Bite Sized Steak and a Tofu Steak which also look tempting. There are also pork and shrimp entrees. If you're really in an adventurous mood, try the Beef Tongue, Barbercued Eel, Tofu Duck, or Monk fish Liver. This is one of those restaurants where the dessert menu is as interesting as the regular menu. Ice Cream comes in green tea, red bean and ginger. There's Tucker's Mom's Cheese Cake, and Golddigger Carrot Cake. We can get cheesecake and carrot cake elsewhere, but this is the only place we know of to get those three ice cream flavors, and we really love the ginger. 848 East High. 269-9291. There is one parking lot behind the restaurant and another opening off South Ashland one block back with a walkway through. 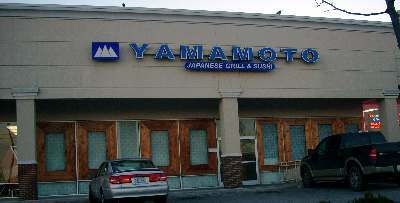 Yamamoto prides itself on its Samurai dinners of steak, chicken and shrimp. 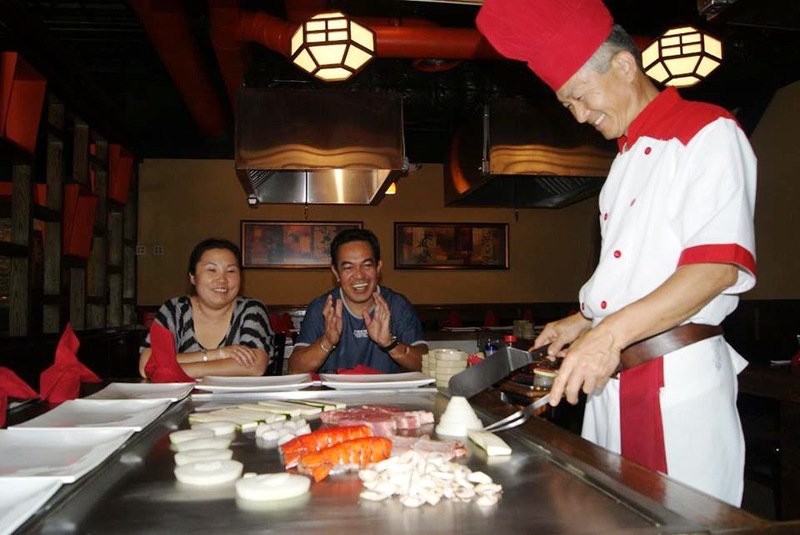 Their Hibachi lineup leans heavily to combination meals of three seafoods, or mixes of steak, seafood and chicken. All their dinners are served with Japanese Onion Soup, salad, shrimp, whatever local vegetables are in season, steamed rice and raspberry sherbert. 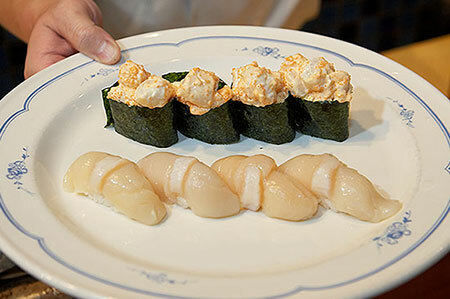 But, in classic Japanese style, Yamamoto also offers the full lineup of rolls. They are most proud of their red dragon, yellow dragon and Samarai Jack rolls. And of course there is the sushi bar. Their famous specialty is the Pretty Woman Roll. It includes shrimp, tuna and avocado, wrapped in rice, and topped with fish eggs. Visually, it's a work of art. And it tastes even better. 130 West Tiverton Way. 272-6668. You access West Tiverton from Nicholasville Road. Pass Fayette Mall and the car dealerships, move to the right lane and look for the next right turn. The restaurant is on the left about halfway up the gradual hill.